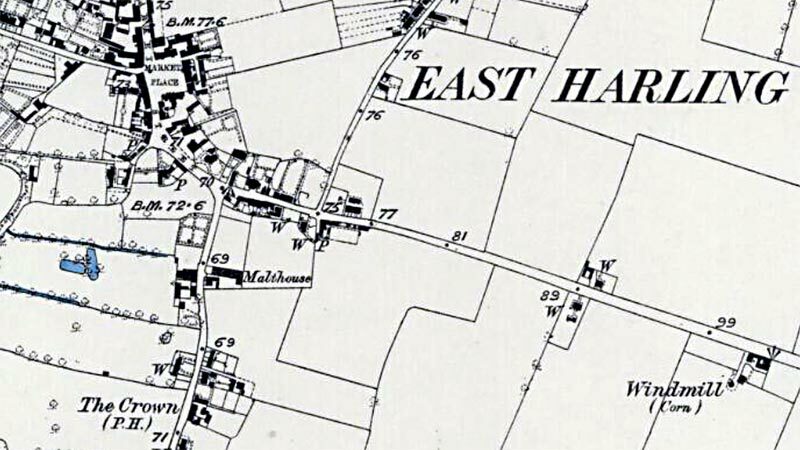 East Harling towermill on the Kenninghall Road, had a 35 foot high, four storey tarred brick tower with two doors on the ground floor. The tower was 20 feet in diameter at the base and the walls were 18 inches thick. 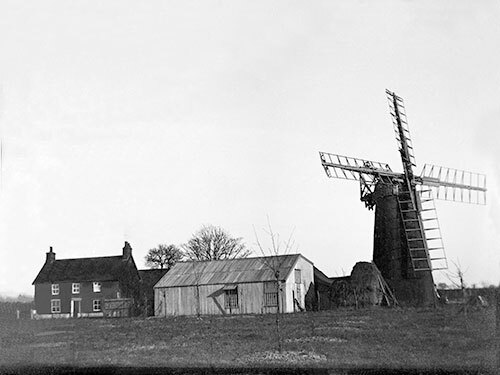 The four double shuttered sails, each with 8 bays of 3 shutters powered two pairs of French burr stones, a flour mill and jumper and were struck by rack and pinion. The domed cap was vertically boarded and formed its own petticoat, a rearward extension held a 6 bladed fan, which in the time of the Lawrence family had coloured blades. 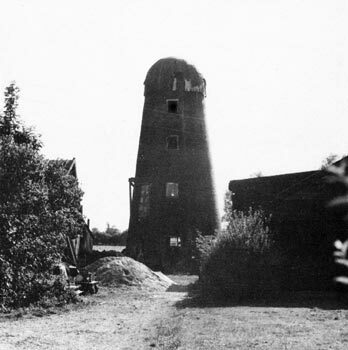 The windshaft came from Topcroft postmill. 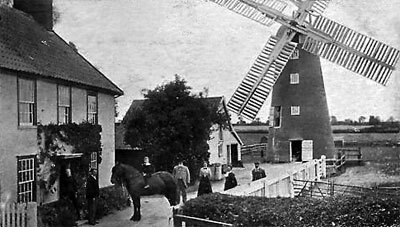 A TOWER WIND-MILL most desirably situated at East Harling in Norfolk & exceedingly well winded, in which are two pair of stones, flour mill & going gears complete, with five acres of Land adjoining & suitable buildings thereon. Apply personally (or by letter if post paid) to Mr. John Burlingham, Old Buckenham, Norfolk. All the substantially built BRICK TOWER WINDMILL, four floors, driving two pair of French stones, flour mill & jumper, with good stowage, well situated, patent sails & winds herself. Likewise about 10 acres of Arable Land with a good barn, granary & offal chamber, waggon lodge, stables, cattle shed & walled-in yards etc. erected thereon. 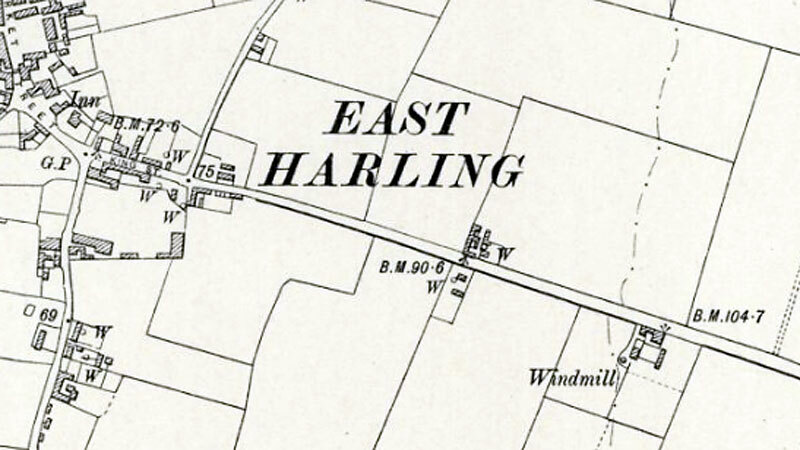 the above Property is all, Freehold & is situate in the parish of East Harling & adjoins the high road from Harling to Kenninghall & now in the occupation of Mr. Jary. Apply to Mr. Daniel Calver, Solr. Kenninghall, or at the Auctioneer's office, the leys, Attleborough. 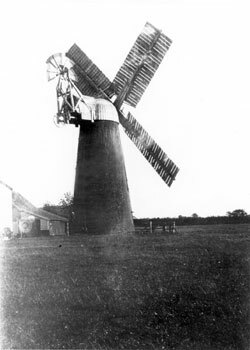 The Burlingham family also owned more than one windmill in Old Buckenham and for many years John Burlingham ran Old Buckenham towermill. Auction by Geo. W. Salter, Swan Inn, East Harling. Tuesday 21 February 1854 at 5 o'c. Possession if desired Michaelmas next. Apply to J. C. Calver, Solr. 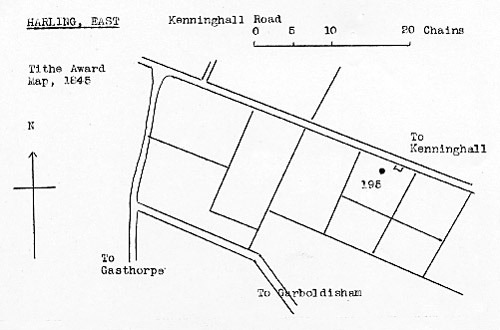 Kenninghall & Long Stratton or Auctioneer, Attleborough. WANTED immediately, a respectable Young Man willing to make himself otherwise generally useful, as IMPROVER in the above Business. Apply Mr. Laurence, Miller, Harling. A sad discovery was made on Tuesday when Mr. T. C. Lawrence of the Mill was found hanging from a beam in the lower floor of the mill. This discovery was made by his son, who having missed his father, was searching the premises for him. Life was quite extinct when the body was discovered. An inquest was held on Wednesday at the White Lion Hotel before Mr. G. C. K. Burne coroner for the Liberty of the Duke of Norfolk. Mr. W. Williams acted as foreman of the jury. 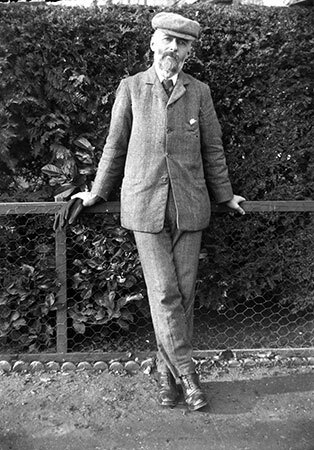 All persons having any claim or demands against the estate of Thomas Clarence Lawrence, late of East Harling in the county of Norfolk, miller, deceased, who died on the 3rd day of September 1912, are requested to send forthwith full particulars thereof to Mr. Walter W. J. Kerridge of East Harling aforesaid. And all persons indebted to the Estate of the said Deceased are requested to pay the amount of such debts to the said Walter W. J. Kerridge in order that all proper deductions may be made upon application for the Grant of Probate of the Will of the Deceased. Dated this 6th day of September 1912. The mill was bought in 1913 by Christopher George Pattinson, who was already working Garboldisham_post_mill. His son Christopher Augustus ran the mill with the help of Mr. Billy Park who had been chargehand for many years with Thomas Lawrence. 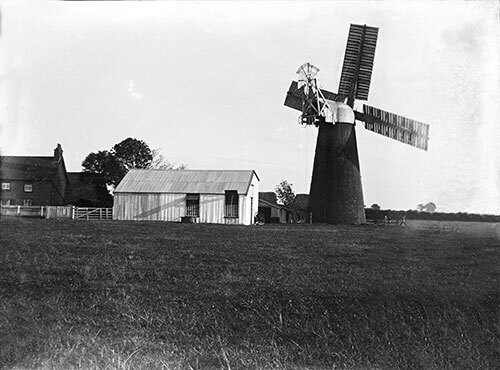 The windmill ceased working in 1919, but grinding was continued till 1922 in a shed some way from the mill, where stones were driven by an oil engine. New cap. Whit epainted aluminium sheeting on domed wooden frame, with extension to rear, but smaller than before. Of two aquare flanges for boltiong on each sid eof the brake wheel, one is now forward of the weather beam. Although not envisaged in near future, if sails required, this would cause trouble in fitting head wheel. BRECKLAND DISTRICT COUNCIL Planning Dept. 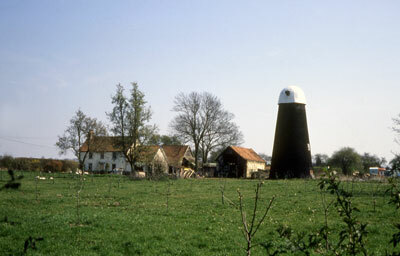 Change of use of mill tower to dwelling. 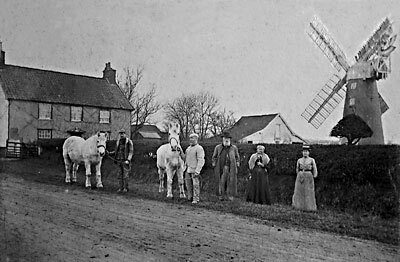 I have an old family photo of East Harling mill that is the same as the one on your site, at the top of the page. My is sepia and very old and tatty. 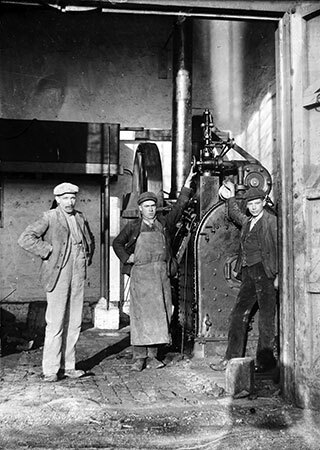 It was my Grandads and he said the man in the mill door way is William Park, who would be my Great, Great Grandfather. He worked at the mill.